Now Tata Pixel to enter production in Europe; Nano Europa gets dumped! The cute-looking Tata Pixel concept drew the most oohs and aahs from on-lookers and critics alike at the recently held Geneva Motor Show. So overwhelming was the response that Tata Motors has now decided to dump its small-car project based on the Nano Europa for a production version of the Pixel concept in Europe. 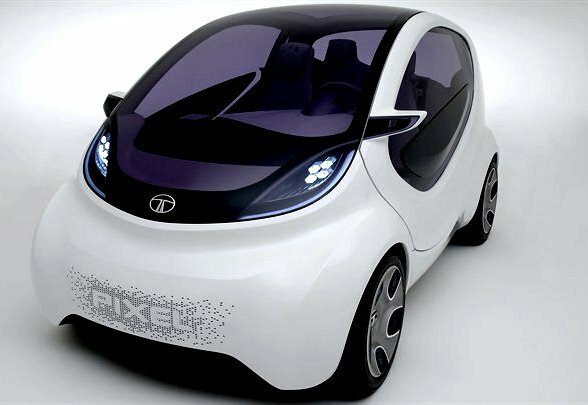 Tata Group Chairman Ratan Tata reportedly told Autocar that the Pixel concept will partly replace the proposed Nano Europa. He added that the production version of Tata Pixel will come with conventional doors (instead of the scissor doors in the concept that rotate upwards), contemporary instrument cluster and controls. The company claims the Tata Pixel will be ‘the most package-efficient 4-seater in the world’. Tata Motors showcased the Pixel concept car at the Geneva Motor Show on March 2nd 2011. The Pixel is powered by a rear-mounted 1.2-litre, 3-cylinder, diesel engine that puts out 60 bhp. Tata claims the Pixel could return a claimed 29.4 km/litre (3.4 litre per 100 km) as per European driving cycle and will emit just 89 grams of CO2. That would make it the most fuel-efficient 4-seater car in the world! The Tata Pixel concept boasts Zero Turn toroidal traction-drive Infinitely Variable Transmission (IVT). In layman terms, that will help the Pixel achieve a remarkable 2.6 metres turning radius! That’s far better than the Tata Nano, which has a turning radius of 4 metres! Importantly, the Pixel has improved chassis and better handling abilities than the current Nano. « Honda plans price hikes; car makers offer heavy discounts!